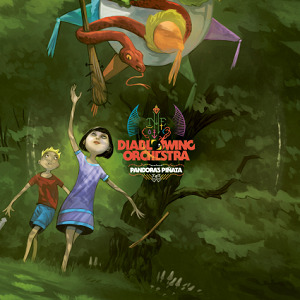 Pandoras Pinata is the third album from Swedish band Diablo Swing Orchestra. Diablo Swing Orchestra are one of those bands that can't be descibed easily (if at all) as they really don't fit into any normal musical genre or category. I can imagine if you taught the inmates of a lunatic asylum to play and sing the results would be more normal than this - DSO really is quite utterly crazy music, but its also absolutely brilliant. The old saying says that there is a fine line between genius and insanity, and Diablo Swing Orchestra are proof of that - what they produce would sound insane if you descrbe it, but when you hear it then it becomes clear that its a work of genius. Lets start with a quick look at the instruments used on the album - electric guitar, synthesiser, drums, bass (sounds like any other metal band so far doesn't it? ), Cello (ok not often used in metal but Apocalyptica have proved it can work), Trombone, Trumpet, Flute, Clarinet, Mandolin, Horn, Oboe, Double Bass, Violin and Viola. They've taken the instruments used by an orchestra, a brass band, a heavy metal band, and a folk band and by using them all together have produced something utterly unique. The album kicks off with the first song to be released - "Voodoo mon amour" - a superb song that is just what we've come to expect from Diablo swing orchestra. "Aurora" is an odd song in that it's more like a straight opera song rather than the fast paced swing style that we're used to with Diablo Swing Orchestra. It's still very good, just not what I'd expected. There's only one thing I dislike with this album - the last part of the final song, "Justice for Saint mary". They've decided to use some awful effects on it that are frankly so appallingly bad that I can't listen to the whole song and just skip it once it reaches that last part which is a real shame as it ends the album on a bad note when the rest of the album is great. I'd certainly recommend that you check Diablo Swing Orchestra out on youtube if you havent listened to them before - their new video, "Voodoo mon amour" is a good starting place. This is a fantastic album - totally crazy, and utterly brilliant at the same time. It's so different to anything else you'll hear that it stands out and its got such an addictive quality that you'll be listening to this for ages. Pandoras Pinata will be released on 22nd May via Candlelight records.